Procon Technology can supply the following Japanese made anti-static soldering station and accessories. Please see prices below and for quantity pricing email us. In Australia, call 03-98306288 now to buy! 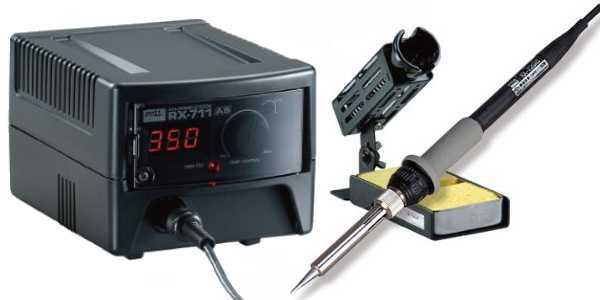 SPECIAL OFFER: Buy the RX-711AS soldering station and receive a FREE DMM (Digital Multi-Meter), a UNI-T UT33C, with temperature probe to calibrate your soldering iron AND a 0.2mm tip (PX-60RT-SB) - valued at $44. For an independent review of the RX711AS (new model) - click here. The secrets of good soldering... with Goot... click here. How to solder with Goot (PDF 9.95MB)... click here. The RX-711AS features temperature adjustment and display. This soldering station is a precision, Japanese manufactured instrument with excellent temperature stability and anti-static characteristics. The light weight soldering pencil (80 grams) has a grounded tip and incorporates a ceramic heater with an integral temperature sensor. The sensor provides precise tip-temperature information to the heater controller which maintains the selected heat setting with a high degree of accuracy. Temperature stability is further enhanced by designing the heater to actually fit within a matching recess in the tip. This allows faster heat transfer and therefore better tip-temperature recovery during heavy soldering. The soldering pencil is fitted with a silicon rubber grip for added handling precision and a 1.2 metre long silicone sheathed cord attaches to the console controller via a 5 pin DIN connector. The silicon cord is incredibly supple. The controller is a deceptively simple yet sophisticated unit. The control panel includes the 3 digit LED digital temperature display, a rotary temperature control, calibration control and a display changeover switch to display either the desired or actual tip temperature. The panel is secured behind a darkened see-through cover which prevents accidental temperature changes but can be easily accessed when required or it can be locked with the phillips head screw provided. Specifications: Power requirement: 220-240VAC 50/60Hz. Soldering Temperature: 200°C to 480°C (ideal for un-leaded solder). Temperature hystersis: +/- 3°C. Goes from cold to 350°C in 45 seconds. RX72GAS soldering pencil: 24VAC 60W (lighter and smaller than the RX70GAS). Gross weight: 2.7Kg. Comes with 0.5mm soldering tip (PX-60RT-B). The 0.2mm tip (PX-60RT-SB) is optional (sorry, we have no other tips available), iron stand with sponge, 17 page instruction manual, CDROM and 12 months warranty. Those who have bought a Japanese made soldering iron before will appreciate the difference in quality, if you haven't bought Japanese before you'll soon come to realise how beatifully made their products are and how beautifully packaged their soldering stations are! So, if you've decided that you no longer wish to have your 'fingers burnt' using a cheap soldering iron, we seriously recommend GOOT (Taiyo Electric Ind. Co. Ltd). Like HAKKO - GOOT means quality but at a reasonable price! Payment may be made by debit or credit card (AMEX, VISA or MASTERCARD) by PHONE or MAIL (or email at your own risk). AUD$ prices are Australian dollars. Note, these are EXPORT prices. For delivery within Australia please add 10% GST (use +GST column). For current exchange rates click here. For an order form that you can print out and mail to us - click here. Delivery charge within Australia $16.50 for RX-711AS and $11 for other items (any quantity). Delivery to all overseas destinations - P.O.A. (ask us). EX-GST purchases may only be made when the delivery address is outside of Australia. i.e. for EXPORT orders. Prices subject to change without notice.